Oh hi there. It's been a while since I've posted. Life didn't just get in the way, it rugby tackled me out of the blogosphere, but I've clawed my way back and I'm going to try and contribute more often. Baby steps. Starting with, of COURSE, a new Monday Morning Mugs post. I love finding these so much because they genuinely do brighten up the dreariest of days - warming, invigorating caffeine has nothing on the pick-me-up you get from drinking out of a funny mug that makes you smile. This time it's a pun-ny one AND a sweary one. Oh yes, double trouble. 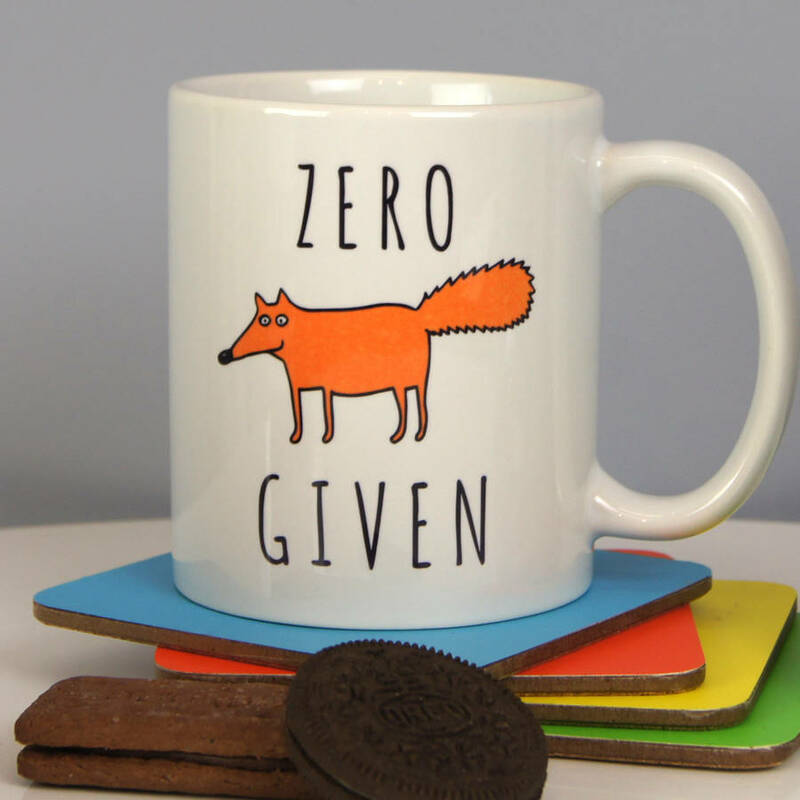 The zero fox given mug is the genius creation of Parkins Interiors on Not On The High Street. I love it SO MUCH because, as well as being a clever pun and a good excuse to have a mug with a cute animal on it, it is going to remind me not to let the idiots get to me EVEN ON A MONDAY MORNING. Zero fox given, indeed. It's actually part of a series - there's also the Oh For Fox Sake mug, the I Really Couldn't Give Two Fox mug and the What The Fox Going On mug. That's just the tip of the iceberg in terms of Parkins Interior's wit, but I'm going to save the rest for another day. You can pick up a zero fox given mug for a mere £12 on NOTHS - money well spent, believe me.